Trippy Food | "The Gastro and Petrol Report"
When you're a European-born chef trained in classical French cuisine, it only stands to reason that the obvious thing to do in order to utilize your culinary talents is to open a chip shop in Santa Barbara, California. 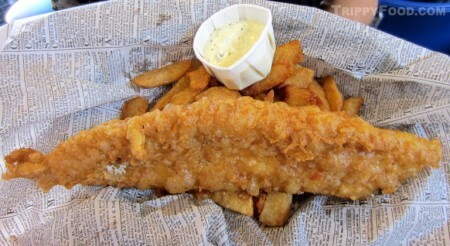 Although British expatriate Grant "Mac" MacNaughton offers typical and traditional chippy fare (such as fish and chips with mushy peas), he also playfully takes the menu where few men have gone before. The first indication that MacNaughton has turned the chip shop on its ear is the decor - where most respectable chippies in the U.K. might barely achieve a "B" letter rating in Los Angeles county, Mac's is sparse, crisp and neat. There’s no menu board menu with plastic letters missing here, no bins of pre-cooked fish or chips under lamps - everything is made to order and the place is spotless. As with any chip shop worth their salt, Mac's uses cod as their fish of choice; however, instead of the familiar Atlantic cod used for battering and frying, theirs is sourced from Alaska. All of Mac's fried items (which include the fish and chips) are served in baskets lined with fake newsprint to recreate the British experience without getting ink all over your hands. The ample fish filet is flaky, hot and tender with only a slight residue of oil from the fryer. Bangers are also available from the menu - these are sourced locally, made especially by Shalhoob Meat for Mac's. Naturally you can also get a side of baked beans (Heinz, of course - the most popular tinned baked beans in the U.K., courtesy of the folks from Pittsburgh, Pennsylvania known domestically for their ketchup), the aforementioned mushy peas, curry sauce - everything you'd expect to find in a British chippy right down to the malt vinegar and brown sauce. Mac's also carries homemade meat pies, including Cornish pastys, Shepherd's pie and cheese and onion leaving little to want for the displaced Brit, save for possibly some black pudding. 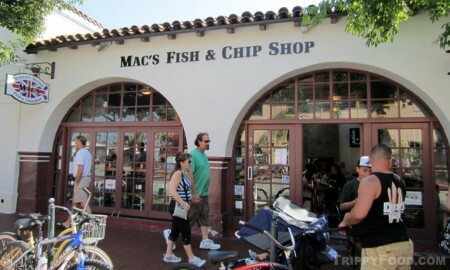 As good as Mac's fish and chips are, I'm as likely to queue up for a newspaper-full in Santa Barbara, California as for a Chicago hot dog, bowl of New England clam chowder or Tex-Mex combination plate - what got me through the open-air archway was the sign in the window advertising something I'd never seen before, even in the U.K. - battered haggis. MacNaughton makes his haggis in large batches, which can be a gamble since it doesn't keep long once prepared. Imagine a baseball-sized orb of the illustrious oat and organ mélange, dipped in the beer-based fish batter and deep fried to dark brown. 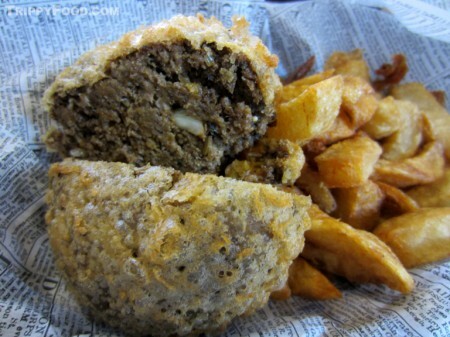 Split with a fork, the steam rises from the gut ball's innards and up to the nostrils to confirm that Mac's haggis is the real deal (sans lights (lung), which the state of California bans in either fresh or imported haggis). The taste is a tad less earthy than a sturdy haggis consumed in the U.K., but it is still heady, fragrant and bursting with flavor although in its deep-fried form the inside temperature is slightly less than the surface of the sun. 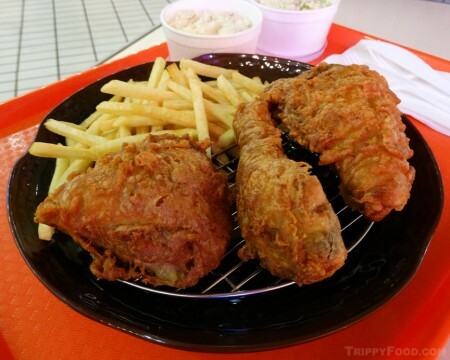 Those who were living in Southern California in the 1970s may recall a time when Pioneer Pete was circling the wagons and flipping the bird at The Colonel; Pioneer Take Out (more commonly known as Pioneer Chicken) was once a formidable opponent, having hatched from the Pioneer Market in Echo Park back in the early 1960s. The company couldn't compete with the corporate conglomerate yardbird shacks, and by 1987 founder H. R. Kaufman had manned his last Frialator. The hatchet fell for the last time in 1993 when AFC Enterprises (parent company to Popeye's) purchased what remained and converted most of the restaurants to Popeye's. Today, there are three locations remaining (with full restaurants on South Soto Street and in Bell Gardens); a restaurant on a busy wedge along West Olympic Boulevard closed in 2014 and the building went up for sale (hopefully for some enterprising businessman to reopen as a Pioneer Chicken, rising from the ashes like a phoenix chicken). In the meantime, the assets of the Olympic location reappeared in the Koreatown Plaza Food Court in February of 2015. Loyalists and nostalgia buffs can rekindle that gas flame at the two restaurant locations, but for the food adventurer who wants a taste of the past in an out-of-the-ordinary setting, your best bang for the buck is the Koreatown Plaza location. 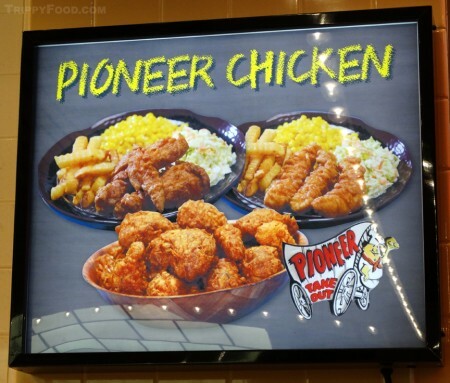 Because of the requirement that they abide by the regulations of the food court, finding Pioneer Chicken proves the adage that life is about the journey, not the destination. With the abundance of neon signage, you won't find a back-lit throwback cartoon Pioneer Pete sign - the food kiosks carry Korean names, and the chicken is to be found at Bab Han Kki, One Bite. 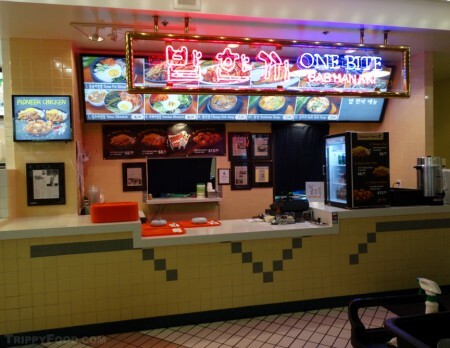 The vinyl banner below the light up Korean food signs provides the minimalist fried chicken menu; there are essentially three dishes from the once-popular chain. Apparently, no one went over the food truck rule book with Filipino upstarts Dollar Hits. For starters, the mobile kitchen isn't - you can always find them on the middle of a block on L.A.'s Temple Street in Filipinotown in front of a small strip mall and a stone's throw between hipster Echo Park and the eastern fringes of food-centric Koreatown. The business side of Dollar Hits appears to take place in the omnipresent nondescript white van parked in front of the matching canteen. If you can't find the truck by sight, fear not - the sound of Pinoy pop music and proprietor Elvie Chan on the megaphone-quality mic will indicate the truck's location better than your TomTom. 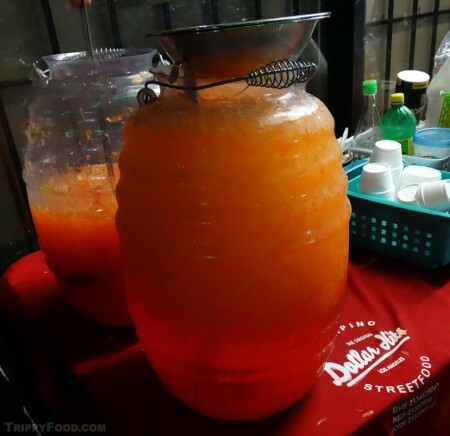 Chan (along with her sisters Nely and Josie) launched the business in 2014 with a unique concept: provide comforting Filipino street food at a price that can't be touched by the gourmet wagons saturating Los Angeles' streets. The bulk of the menu is comprised of traditional bites on wooden skewers; each one (with three or four pieces) runs a tidy little dollar each, proving that Dollar Hits is not just a catchy name. The trick here is that the skewers are partially cooked - patrons flaunt their charcoal mastery by finishing the items over grills on the sidewalk. It's a community affair - friends are made, and street cred is built when the onlookers watch you neatly polish off that $2 balut. Items are ordered off a checklist, and your selection is given to you in a foil casserole pan. 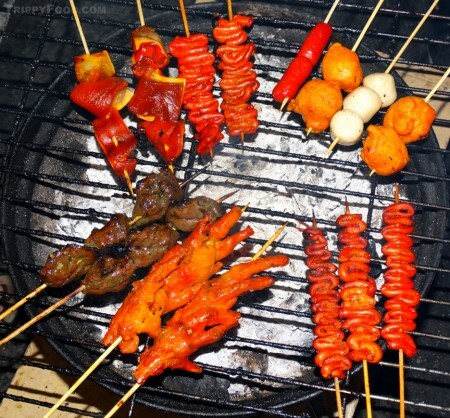 The skewers are a thing of beauty, with organs and various bits of a variety of animals marinated and ready for the hibachi - bright orange fluffy kwek-kwek (battered hard-boiled quail eggs), the aptly named Betamax (gelatinous cubes of congealed pork blood), (Isaw) coiled chicken and sliced pork intestines, and chewy, savory Adidas (chicken feet). There's a spicy, vinegar-based sauce and a sweet sauce for dipping, and the knowledgeable staff will recommend which skewer gets dunked in each. 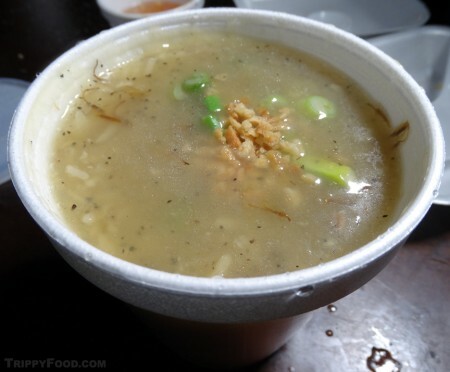 In addition to the skewers, there's a plethora of other Filipino comfort food such as the aforementioned balut, lumpia, and a thick and almost clear arozcaldo (rice porridge) with onion and toasted garlic, the perfect dish for a brisk Los Angeles evening. NOTE: The cost for the food was provided by Dollar Hits, which did not influence the content provided in this article. Americans of European ancestry imagine a trip to Taos, New Mexico should include browsing through the galleries and studios of the vibrant century-old artist community or a day of exceptional skiing at Taos Ski Valley, yet a visit to the area without experiencing Taos Pueblo is a missed opportunity to understand how a culture that thrived centuries before a lost Christopher Columbus trod roughshod through the New World persevered with pride and determination despite centuries of oppression. 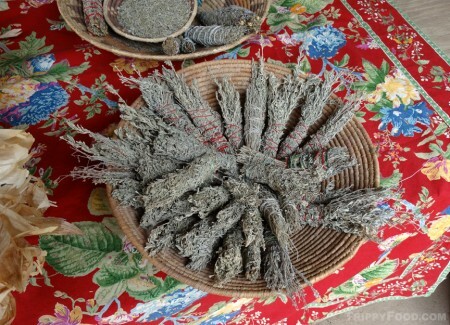 The Taos tribe of Pueblo Indians took their name from the Tiwa description of the area as "the place of the red willows". 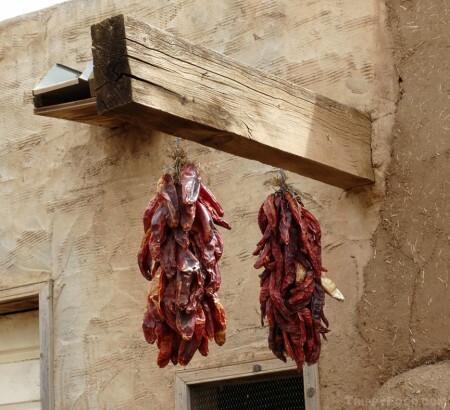 The pueblo was established approximately a thousand years ago, with most of the adobe dwellings dating between 1000 and 1400 A.D., making it the one of the oldest continuously inhabited communities in what is now the United States. Of nearly 2000 Taos tribe members living in the area on ancestral lands, around 150 live full time inside the old pueblo without electricity or running water in living quarters that have been passed down through generations of family. The thick adobe walls were designed for insulation from the elements as well as security; entrance to the one or two room dwellings was originally through a hole in the roof via a ladder (which could be retracted for safety). 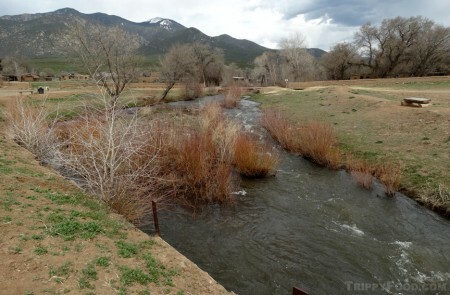 Remnants of the Spanish conquest in the early 17th century are painfully obvious, starting with the 1850 Mission San Geronimo de Taos (which anchors the pueblo and was built by forced labor in an effort to convert the Taos people to Christianity). The original church was built in 1619, but destroyed several times during conflict with the Spanish, as well as the territorial government of the United States; at the entrance to the pueblo, only the bell tower remains, reserved as a holy place to commemorate the men, women and children who died there after the U.S. Calvary put down the Taos Revolt of 1847. The Spanish also introduced the concept of doors and cemetery burials in caskets. While a large portion of the Native American community incorporate some form of Christianity into their belief system, they also maintain much of their original ideology (the Virgin Mary figures prominently in religious imagery, acting as a surrogate for the earth mother). With the indignities unleashed upon the Taos people by the Spanish, Mexico, marauding Comanche, and the United States, one has to wonder why they freely and open-heartedly welcome tourists into their ancient home, but they do so in a warm and inviting manner that is a model of peace and friendship. Before visiting, become familiar with the customs and respect the values and decorum set down by tribal law so that you do not become the ugly American. 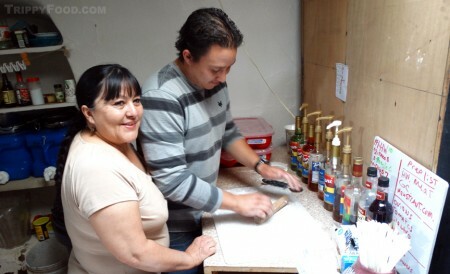 If local crafts are your souvenir of choice, many shops located at the pueblo offer authentic and hand-made art, including unique glittery pottery infused with mica - ask for permission before photographing tribal members and respect their wishes if they decline. There are no restaurants to speak of in the pueblo, but a unique dining experience is to be had at the Adobe Cafe, located directly across from the church. The tiny one-room cafe is run by Mary Esther Winters (whose Tiwa name translates to Looking for Blueberries) and her son Robbie (Eagle Bow) in a family-bestowed adobe dwelling with a fireplace for heat and a wood stove tucked into a diminutive kitchen. All of the food is made from scratch on the premises; the signature Pueblan fry bread is made from ground blue corn that was grown at the pueblo. While sandwiches, Frito pie, salads, and other substantial menu items appear handwritten on the board, the perfect accompaniment to the sweet fry bread is a hot cup of freshly brewed piñon coffee, flavored with locally grown and roasted piñon (pine nuts). Winters gushes with pride at a large Kodak print hanging on the far wall of the cafe - it is a photo of her grandfather, Ben Marcus, whose image was selected to be one of the 30 by 36 foot illuminated color prints displayed on the Picture Tower at the Kodak Pavilion during the 1964 - 1965 World's Fair in New York. While her joy in running the cafe is obvious, Winters looks to a time in the near future when she can take Adobe Cafe mobile via a food truck. For over 60 years, The Hot Dog Show (later Papoo’s Hot Dog Show) stood its ground on a busy street corner diagonally across from the oldest Big Boy in the U.S. (both built in 1949). There were several other Hot Dog Show restaurants in Southern California, but the Burbank (Toluca Lake) location just blocks from Warner Brothers was the sole survivor, having served red hots to celebrities and locals jonesing for a wiener until it closed in the summer of 2011, seemingly doomed to be razed and resurrected as some gleaming box chain restaurant. Papoo's menu was hot dog heavy, with a variety of char-broiled, canine-themed dishes such "The Dachshund", "The Beagle" and "The Boston Bull" (accessorized with baked beans), culminating in the masterpiece known simply as "The Show Dog". While the dog itself could be considered medium/sporting size, its accoutrements put it squarely in the large breed category - the hot dog was obscured with a generous mound of firm, grilled spinach, crispy bacon, fat hoops of onion rings and a blanket of industrial-quality Swiss cheese - a dish that required unhinging you lower jaw like a python in order to devour it. In addition to the standard beef variety "show burgers", Papoo's added exotic meats such as elk to the menu in its golden years. The restaurant stood shuttered for almost two years with most of its signage intact, including the tall standalone sign with a harp-playing angelic dog perched on top and a multi-colored neon, winged and haloed hot dog over what was originally the street-facing counter. The layout of the restaurant could best be described as "catch-all"; rooms were added on the stand's flanks and the front of the building was built out to allow bar patrons to eat indoors (in fact, the wood awning that hung over the bar was left intact when it was enclosed. Just prior to locking the doors for the last time, a grassroots effort to save Papoo's Hot Dog Show blossomed on the Internet, but too late to save the financially-strapped institution. Enter, stage left - Southern California's rapidly expanding supernova burger chain Umami Burger. CEO and founder Adam Fleischman has vied for burger supremacy in the Los Angeles area against bulls like Father's Office and has parlayed his empire into what amounts to household word status on the Left Coast. 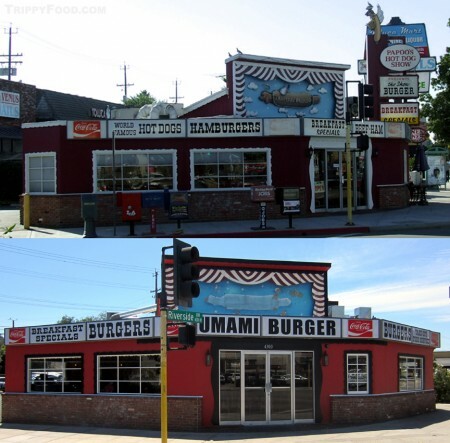 The chain's concept in opening new stores is unique, clever and endearing - Umami Burger preserves the souls of the previous incarnations, which brings the devotees of the dearly departed back into the resurrected space. In the case of Papoo's Hot Dog Show, the restaurant underwent a renovation, but one has to imagine it would be what previous owner Leona Gardner would have done if money was no object. 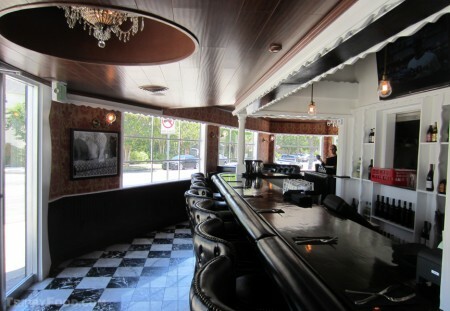 Red Naugahyde booths and Formica-topped ice cream parlor table and chairs have been replaced by upscale black faux-leather booths and wooden tables (including in the expanded rear patio); chandeliers hang from wood ceilings, framed by walls covered with Victorian flocked wallpaper. Outside, you could be excused for doing a double-take - aside from the removal of the vertical sign and the neon wiener (which is alleged to now be convalescing in a nearby neon museum), the exterior looks almost the same (naturally a couple of the front lighted panels now reads "UMAMI BURGER"). 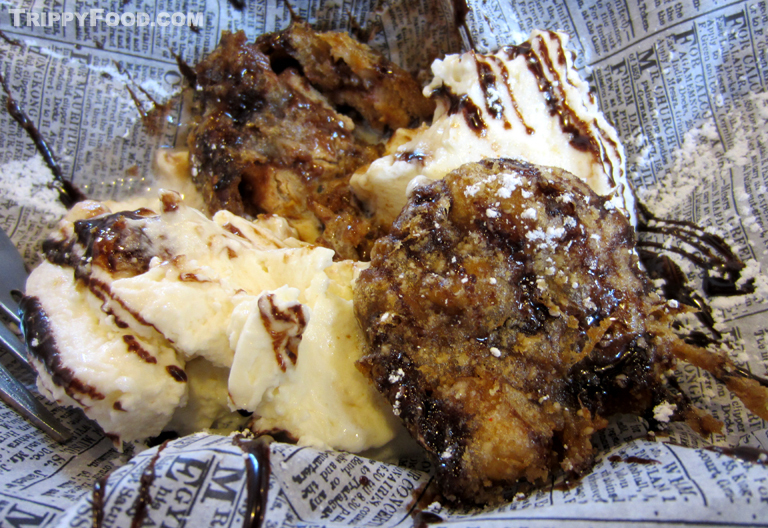 Homages to several items from Papoo's menu have found their way onto Umami Burger's; I use the term "homage" because the similarity ends at the name. 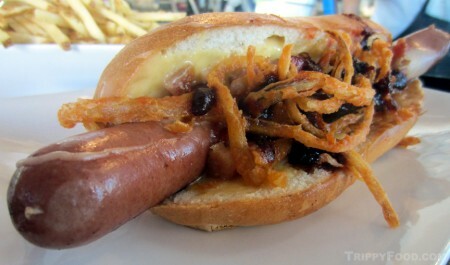 The new Show Dog is a Irish wolfhound-sized behemoth jacketed in a Portuguese buttered and grilled bun. 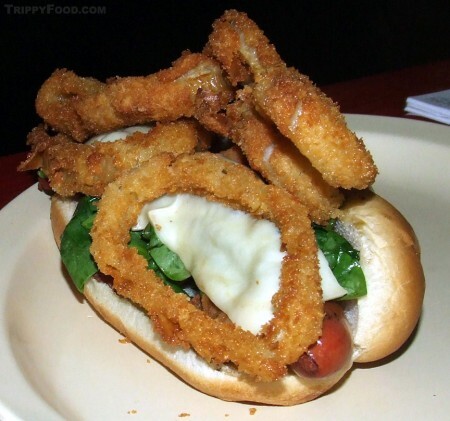 The dog is lightly blanketed with chunks of minced bacon and fried onion strings slathered with liquid beer cheese and a generous dose of Hak's BBQ sauce. 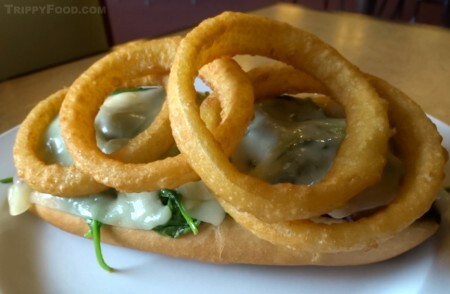 While UB's Show Dog is nothing short of delicious, the umamiable experience is bittersweet - imagine a property developer saving your ancestral home and restoring it to a splendor the likes it has never known, including replacing the beloved matriarch with a hot GILF. While Papoo's burgers were on the A-list of fast food joints in Southern California, they don't hold a candle to the half-pound, coarsely-ground Wagyu beef patties dusted with super-secret umami pixie powder - these meat disks leave the pack of contenders eating their dust; naturally, there's a suitable price tag that accompanies them.